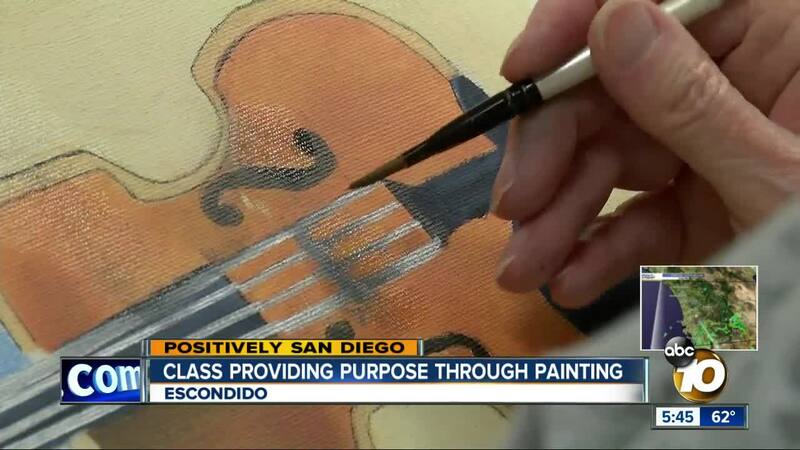 ESCONDIDO, Calif. (KGTV) — Retirees in Escondido are finding new purpose through painting regardless of their disabilities or never having picked up a brush. Cypress Court seniors wait patiently all week for their Thursday morning painting class. All they need are brushes, paint, and a few other tools to bring their canvas to life. Hagerty has been painting since she got to the retirement community eight years ago. The class is led by instructor Janice Eakin, who technically retired five years ago. "I’m down to one day a week now, and soon I’ll be living here," Eakin says. Whether residents are recovering from a stroke, or suffer from hand tremors, Eakin helps each one defy their limitations. Even if that limitation is their vision — John Call can no longer see out of his left eye and only has some in his right. Eakin helps guide his paintbrush. She says it’s not only art, but therapy. "Had a gentleman that was terminal and he would come paint and tell me he forgot about everything going on right now," Eakin recalled. Their inspirations come from calendars, post cards or their own imagination and they’re proof, it’s never too late to find out if they have a knack for art. Some of the residents have actually sold their paintings while others gift them to children, grandchildren, and great grandchildren.